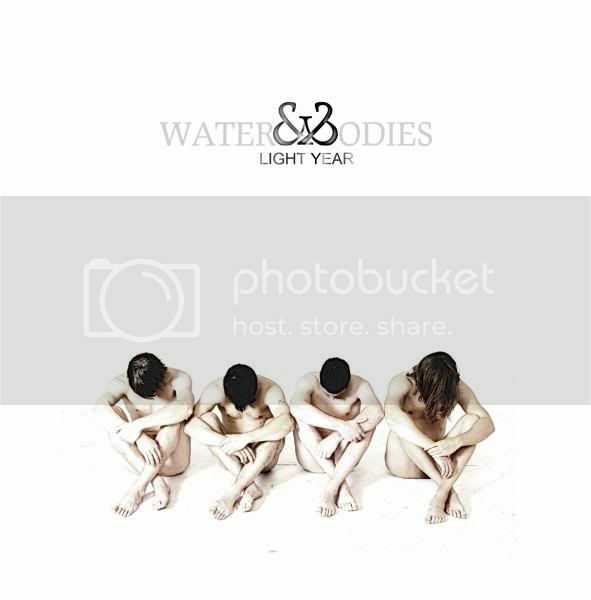 It's quite fitting that Water and Bodies' debut full length is titled Light Year. It's felt like that long since Kaddisfly released their final record. Four of the five members of Kaddisfly create what is now Water and Bodies, but the band's sound drastically differs from its predecessor. The guitar tapping and technical riffs that were prevalent in Kaddisfly have been replaced by more straightforward riffs, keys, and stronger hooks to make what can only be called a "rock" record. Although Light Year may not totally fill the void left by Kaddisfly, it should at the very least satiate one's hunger for the band. From the first strums of the guitar in "Celebration Song", it is clear that Water and Bodies isn't Kaddisfly stylistically. The opening riffs sound like they could be in a Foo Fighters song, bringing back memories of '90s alternative. However, the easily recognizable vocals should bring a smile to anyone that is craving the past. The first clank of piano keys is startling, yet at the same time perfect wake up call to anyone not paying full attention to the record. "Free World" continues the string of bass lead verses and catchy, rocking choruses. Palm-muted strums highlight the bridge, making it easily the strongest part of the song. "Moments of a Life" switches things up a bit, and does it to full effect, as it is the best track on the album. The verses are bouncy, while the chorus is exceptional with a killer hook and excellent backing synth that compliments the guitars perfectly. However, the album takes a sudden halt with the "Parallels", whose chorus is flat and boring, like a great wave that just fizzles out before the crash. After a slight recovery with the average "Echoes", Water and Bodies returns to their strongest with the aptly named "The Return". Along with the aforementioned return to their best, the intro of the song sounds like what could be a return of a victorious night or king, with the majestic sounds of synth and drums creating the feeling of victory. The song also returns some of the experimental tendencies of Kaddisfly, shifting between tempos and moods throughout the different sections of the track. The title track "Light Year" spends the majority of the song building up to the bridge, as well as showing off some of the band's best percussive work. "1980" makes one thing that the band may be running out of steam, throwing distortion on the vocals on the first voice, only to take away one of the best things the band has, which are the unedited, and unique vocals. Luckily, the rest of the album picks up the slack and shows off three of its better tracks. "Lonely Night" has the makings of a rock hit. The combination of powerful riffs and an extremely catchy chorus screams a song that could echo throughout a stadium with everyone's voices singing along. "Written And Read" is one of the most unique songs on the record, as clinking keys and radiating strings support the excellent vocals. "Already Gone" closes the album with a surprise; groovy drums and jazzy keys are at the forefront of the song, creating probably the riskiest track on the album. However, after a slightly safe album, the risk was warranted. Water And Bodies ditched most of the intricacies that made Kaddisfly special, such as the crazy concept albums and the many of the more technical parts. However, what they have done is made an extremely solid rock record, that even though it may be much more accessible, it is not a full appeal to the mainstream. In fact, this record is much better than many of the mainstream rock records out there, and should be appreciated as such.